Hi guys. I'm back after taking an unexpected break from blogging during which the boyfriend and I have been working long hours at our respective jobs, attending friends' weddings, dealing with car issues and, you know, doing life stuff. I'm finding out that blogging is a time-consuming business, and I'm in awe of so many of you who hold it down so deftly along with all your other work and responsibilities. I have a lot to learn about the blog/life balance, obviously! And speaking of balance, today we'll be checking out a new sub that strives to help us achieve the equilibrium of mind, body, and soul that's so elusive to so many busy people out there. Meet Sapphire Soul, which mails out a monthly shipment of products "to inspire your mind, take care of your body and open your soul." Sapphire Soul generously sent me their small Balance Box to review free of charge. 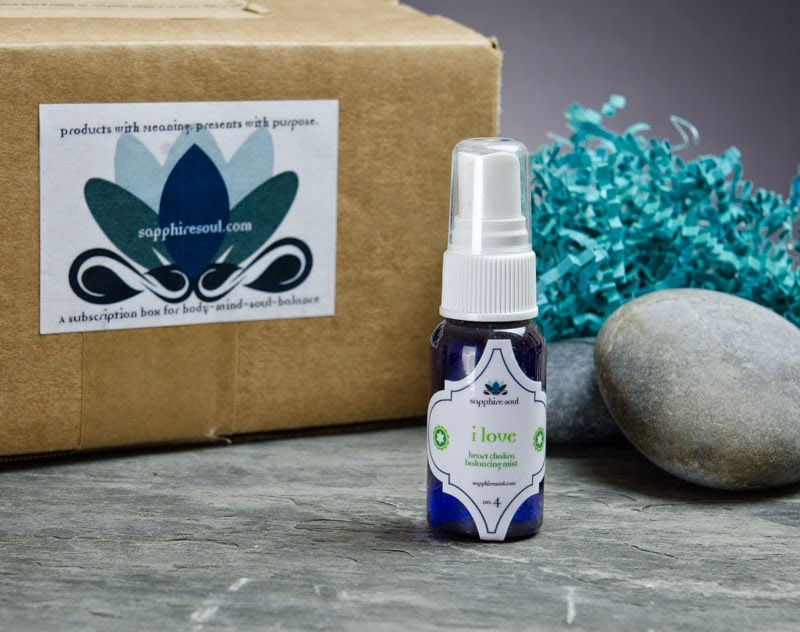 The Balance Box costs $28 per month, and includes a curated selection of items "focused on holistic and organic health," on metaphysics, and that are "good for balancing the energy in your home." 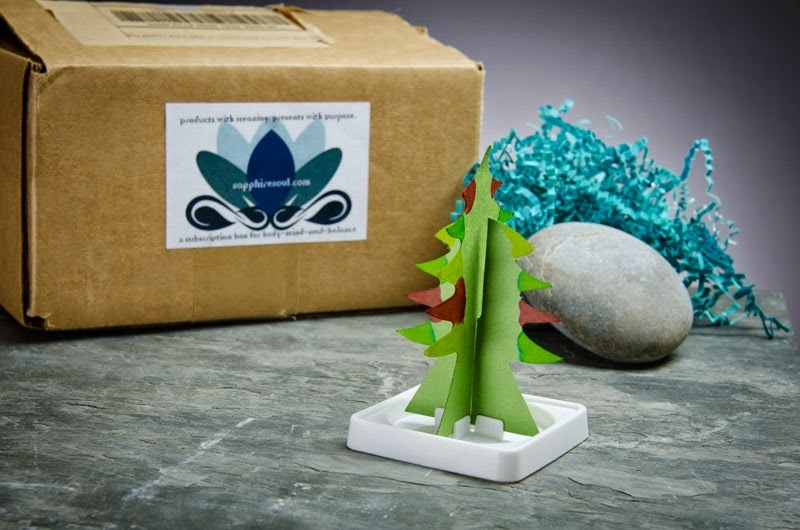 If the small Balance Box isn't quite enough for you, you can upgrade to the large Balance Box, which costs $48 and includes a piece of crystal healing jewelry in each monthly shipment. You can also elect to receive, instead of a Balance Box, a monthly healing jewelry bracelet ($25), a box of crystals ($7), or a box of essential oils ($16). The cool thing about these options is that they're combinable: so if you want a Sapphire Soul sampler but especially love oils or crystals or jewelry and want more, you can sign up for a Balance Box plus any of the smaller targeted boxes to really customize your sub. 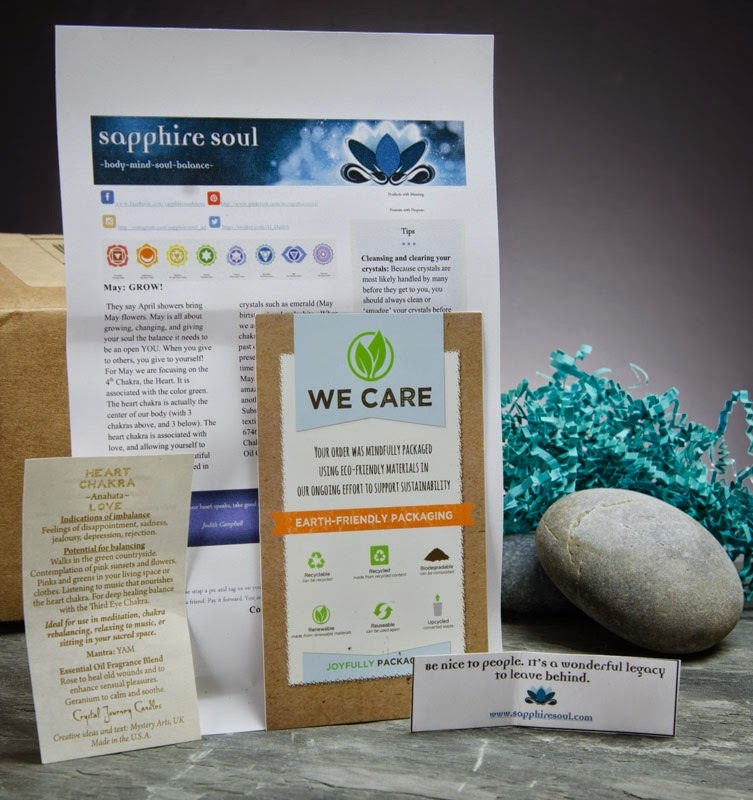 Another nice thing about Sapphire Soul is that they realize we may not all be very well-versed in the care, maintenance, and application of crystals and such, so they provide pretty detailed inserts explaining the reasoning behind the inclusion of each item, along with explanations and tips on how to use it. 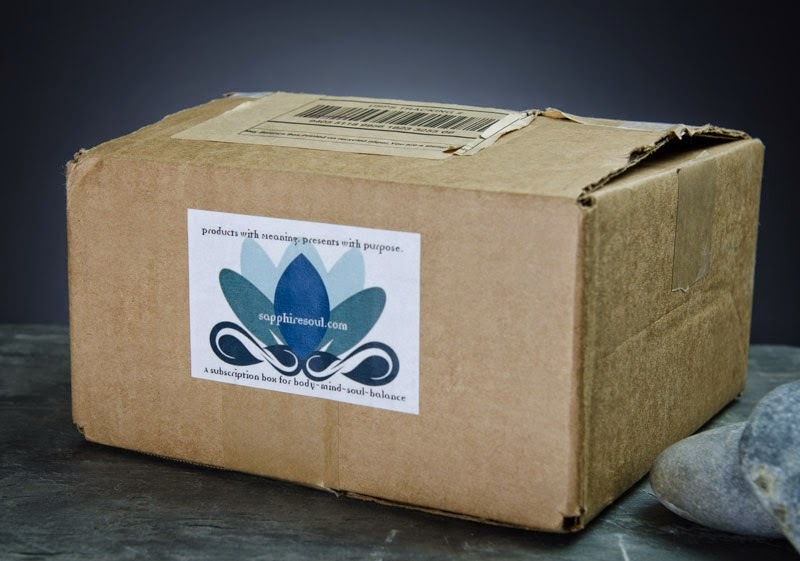 The main insert (the white sheet in the background, above) notes that the focus of May's box is "the 4th Chakra, the Heart." I don't know much about chakras, other than they're central to the Hindu and Buddhist traditions, but the insert helpfully explains that "[the] heart chakra is associated with love, and allowing yourself to open up to everything beautiful around you." Sounds good to me! 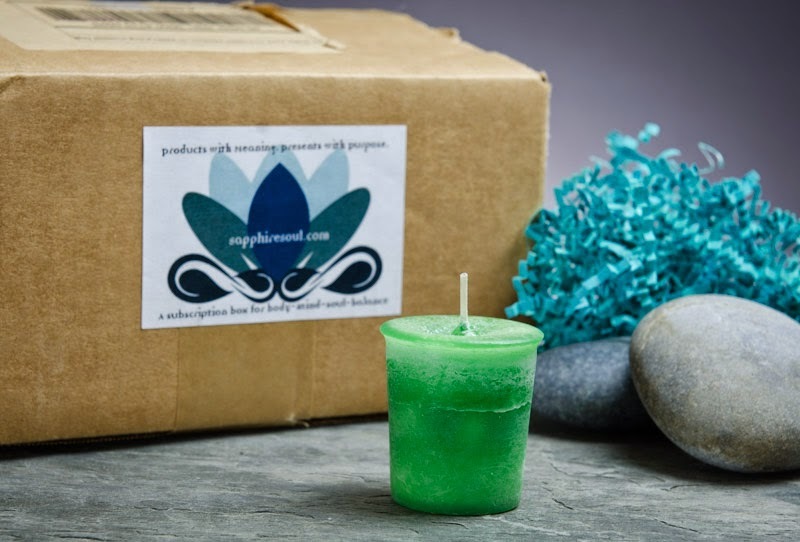 I also learned that the heart chakra is associated with the color green, so there was a green theme throughout the box, from the crinkled packaging shavings to the enclosed candle. This is my favorite item in the box. 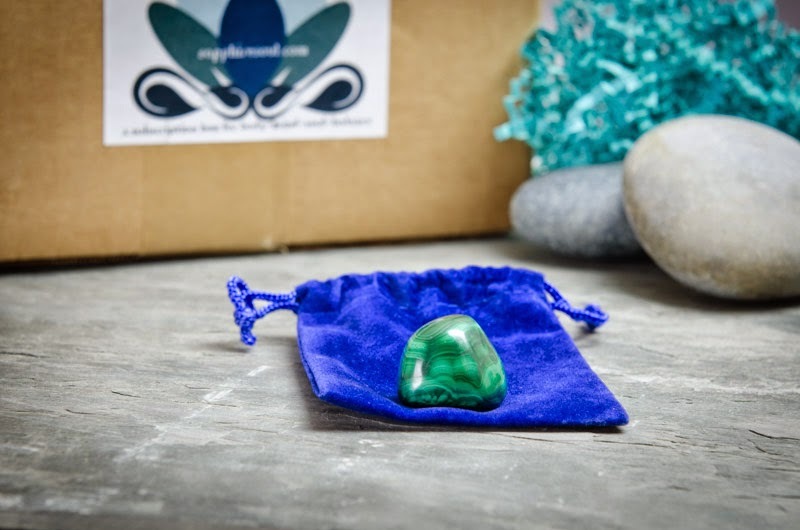 It's a malachite stone in its own little pouch. From a purely aesthetic standpoint, it's gorgeous, a deep green banded by dark dark rings. It makes for stunning jewelry -- my mom has a gold and malachite necklace my dad brought her from a trip to Mexico years ago, and it's stunning. From a more metaphysical angle, Sapphire Soul points out that malachite "is a wonderful protector of children" and "[helps] to lift depression and heal emotional wounds." If I understand the insert correctly, some subscribers may have received an emerald instead of malachite in their boxes. Coincidentally, emerald happens to be the May birthstone, which ties in really well to the green May box theme! This is a heart chakra candle, to be burned while "[focusing] on the intentions and energy you want to bring in while lighting." I confess that I was a leetle underwhelmed by this guy. It has a nice Nag Champa-y scent, but it's so... plain. I guess maybe a fancy label or tin might distract away from the focus you need to take while burning, though. Anyway, I love Nag Champa, so I'll definitely get some use out of this candle. This lavender eye pillow can be heated in the microwave or cooled in the freezer to make a hot or cold pack before placing over the eyes. It's made of a soft, satiny fabric and filled with lavender and organic flax seed. It smells and feels great and, again, would probably work well with a spritz of the oil spray. The package directions indicate the mask can be used "to help alleviate migraines, anxiety, stress, mild depression, and insomnia." I know subscription box tea is a highly divisive subject in blogger circles, but I love tea, so I'm never unhappy to find it stashed in my sub. 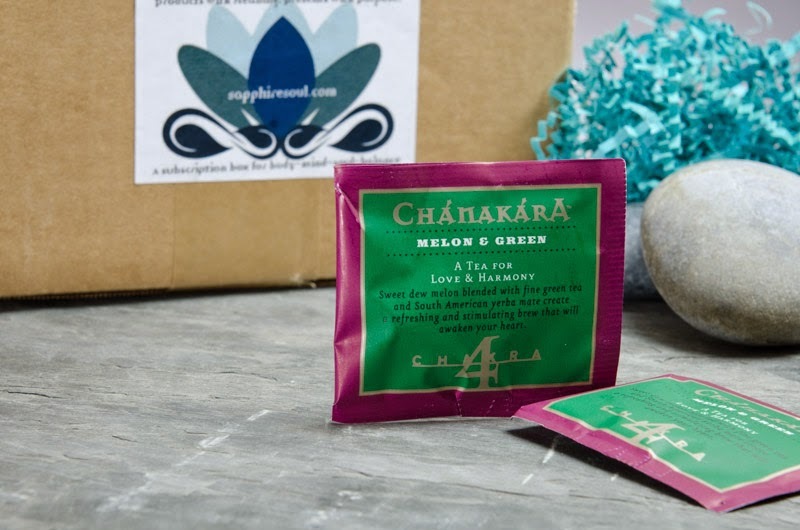 These two little bags are Chanakara brand melon, green tea, and yerba mate blends, and called A Tea for Love & Harmony. Didn't see that coming! 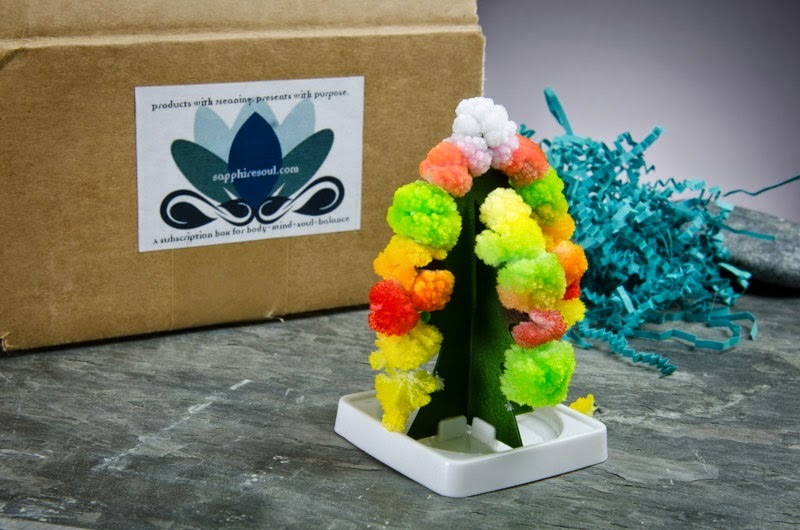 Its boughs are made up of tiny multicolored crystals. WAY better than grow-a-boyfriend! 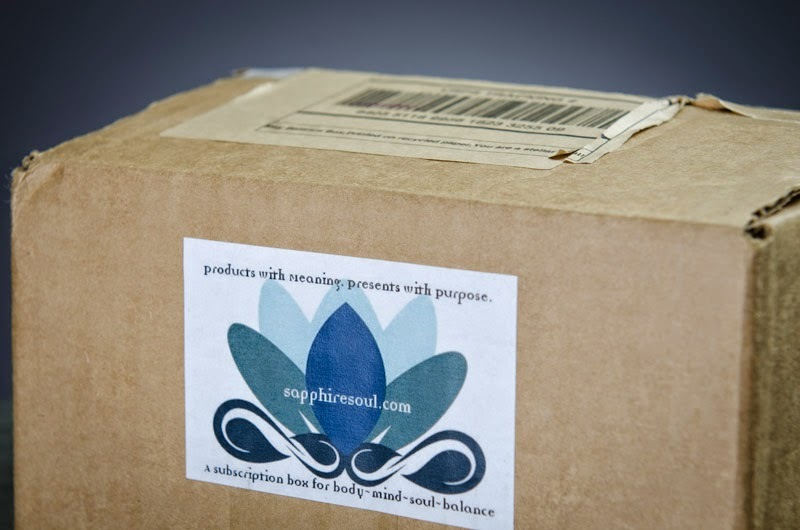 And that's the May Sapphire Soul Balance Box! What did you think? I didn't do a price breakdown for this box, because I think the value here is in the curation rather than the retail price total, which would be difficult to calculate anyway for personalized items like the proprietary essential oil blend. A quick disclaimer: I am totally new to the realm of oils, crystals, chakras, and Western interpretations of Eastern philosophy and religion. I'm not much a believer in the soul, and nurture myself through books, music, travel, science, friendship, love, and food (all the great pleasures in life). Still, I am a big fan of essential oils, think gemstones are gorgeous, and am always looking for smart ways to relax and recharge. I think this sub is especially well suited to people who are inspired by spiritual and metaphysical traditions, but will also appeal to anyone who appreciates essential oils, crystals and gemstones, and receiving thoughtful treats in the mail. 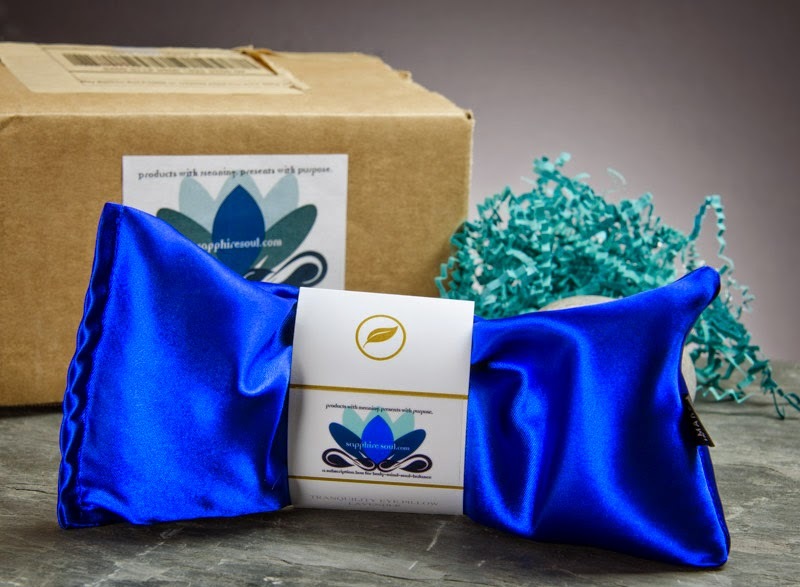 If you're interested in getting your own Balance Box subscription, or would like to learn more about Sapphire Soul, feel free to click on any of the Sapphire Soul hyperlinks throughout this post to navigate to their website, where you'll also be able to sign up for their newsletter and receive a free PDF chakra/crystal/essential oil chart. Also, now through June 15, use code CHANGE at checkout: Sapphire Soul will donate $1 to a women's charity of its choice, and you'll receive a bonus item in your next box. Win/win! And let me know your thoughts on this sub by leaving your comments below. My blog posts may be less frequent these days, but I'm still here! This post does not contain affiliate links, referral links, or other forms of advertising for compensation. 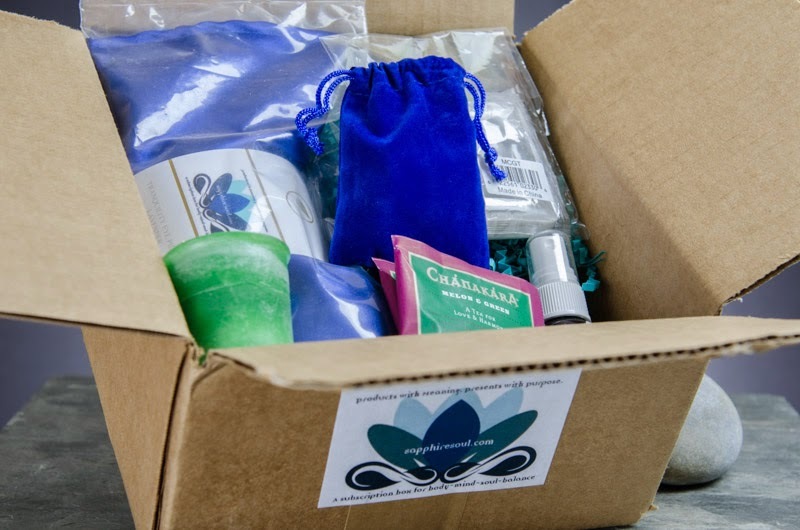 The box and products therein were provided free of charge for review purposes. Regardless, all opinions are my own and never affected or influenced by sponsorship. For full disclaimer and disclosure details, click the disclosure tab above. Isn't the tree cool? It was such an unassuming little thing, and then BAM! Crystals everywhere!